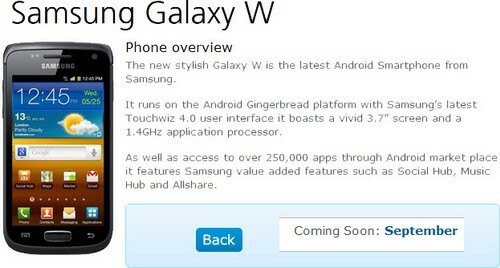 Following on the previous report about Samsung Galaxy W for Three in the UK. Aside from the British carrier, Telefónica's O2 UK has added the Galaxy W smartphone by Samsung to its "Coming Soon" page. For those of you who are new to the Samsung Galaxy W, it's an Android 2.3 Gingerbread-powered smartphone that comes with Samsung TouchWiz 4.0, a single-core 1.4GHz processor, 3.7-inch WVGA capacitive touchscreen display, 5MP rear camera, and more. No word on pricing. 0 comments on "Samsung Galaxy W coming to O2 UK, too"